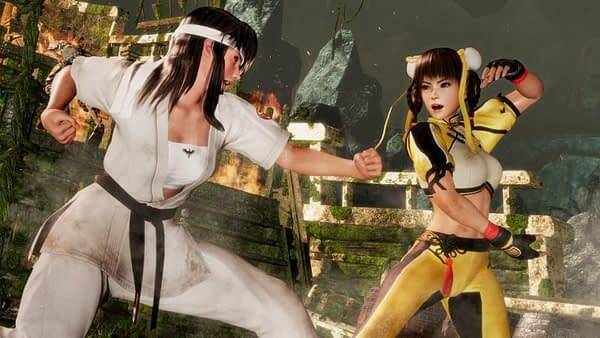 Koei Tecmo put out an announcement just ahead of Gamescom tomorrow that two iconic characters will be returning to the series with Dead or Alive 6. Specifically, Hitomi and Leifang have been confirmed for the roster, alongside a new interactive stage. Those at Gamescom will be able to check out both new characters and the new stage at the Deep Silver booth in Hall 9, #B011-C010 in Cologne from August 21st to the 25th. To commemorate the announcement, naturally the publisher also released a brand-new trailer. For those unfamiliar with the two new characters, Hitomi is known as “The Fist of Innocence” as she’s only 20 years old. She’s of mixed German and Japanese descent and functions as a well-balanced karate expert with a devastating straight punch. Hitomi specializes in techniques that combine both offensive and defensive elements in one strike. So she’s a bit technical to play. Leifang, on the other hand, is known as the “T’ai Chi Ch’uan Genius” and is a master of using her opponent’s power against them with brutal Sabaki and Inashi counters. Both fighters will be highlighted at Gamescom with a brand-new stage called Forbidden Fortune which features the fantastical ruins of an old pirate ship — bones, mountains of gold, hidden traps, and Kraken included. Players can travel through the ship and find some of the hidden pirate treasure, but traversing the levels is not the only thing they’ll have to worry about. The Kraken does have an enrage mechanic which rocks and shudders the ship, damages the ship’s armory, and even ignites the piles of scattered gunpowder. Because otherwise it just wouldn’t be interactive enough. Dead or Alive 6 is currently in development for the PS4, Xbox One, and Windows PC via Steam. It is slated for release in Early 2019. The Gamescom trailer is below.